The 24 HR Ration Pack contains up to 3955 calories and comes with 2 main meals, a sweet and a array of energy drinks and snacks. 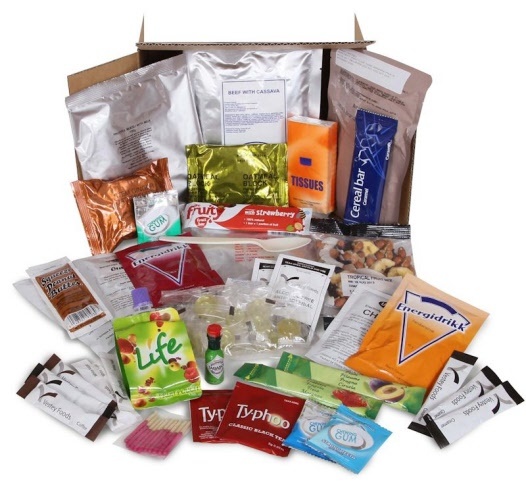 This box has enough to keep you going while out and about in the hills or jungle. Same rations as issued to the Army.. Pasta bolognese turnover, hot pepper sauce. Drinks- Peach iced tea fortified, tutti fruity flavour drink powder, tropical flavour drink powder, grapefruit flavour drink powder, orange flavour hot chocolate.